One police email made a racist joke about President Barack Obama. POLICE IN THE Ferguson had routinely discriminated against African-Americans for years, according to media reports citing a Justice Department probe. The Justice Department investigation into the police department in Ferguson uncovered a widespread pattern of racial discrimination and multiple violations of citizens’ constitutional rights, several US media outlets reported. The findings, due out today, follow the 9 August shooting of African-American teenager Michael Brown by a white police officer in the St Louis suburb of 21,000 with a black majority population but an overwhelmingly white police force and city council. In one finding, the Department of Justice report also unearthed racial bias in emails written by Ferguson police and municipal court officials. Hundreds of interviews, plus thousands of pages of official documents, indicated that Ferguson police officers regularly pulled over motorists without reasonable suspicion, carried out arrests without probable cause and used excessive force, according to the Washington Post and other news media. While African-Americans make up 67% of Ferguson’s overall population, they accounted for 93% of all arrests in 2012 through 2014, the report is expected to reveal. African-Americans accounted for 85% of all people stopped by Ferguson police, 90% of all citations issued and 88% of instances in which force was used. Ferguson’s local judicial system also comes under a harsh light in the report, which says African-Americans were 68% less likely than others to have their cases dismissed by a municipal judge, the Post reported. Ferguson became a flashpoint for tense relations between African-Americans and law enforcement after Brown was shot and killed by police officer Darren Wilson in broad daylight on a residential street. 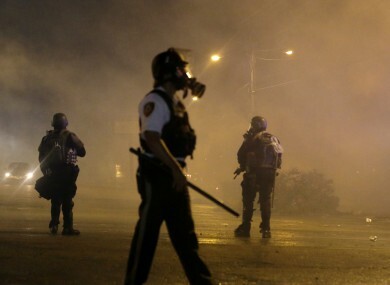 The violence, and the Ferguson police force’s use of military-style weapons and vehicles to tackle protesters, triggered an outcry and gained international media attention. Anger was rekindled when a grand jury in St Louis County, which encompasses Ferguson, decided in late November not to indict Wilson on murder or manslaughter charges. In a statement on Tuesday, human rights group Amnesty International said the findings should prompt Obama to set up a task force to come up with recommendations for criminal justice reform. “The United States still has a long way to go before it has truly accountable policing,” its US director Steven Hawkins said. Email “Police in Ferguson made a racist comment about Barack Obama”. Feedback on “Police in Ferguson made a racist comment about Barack Obama”.